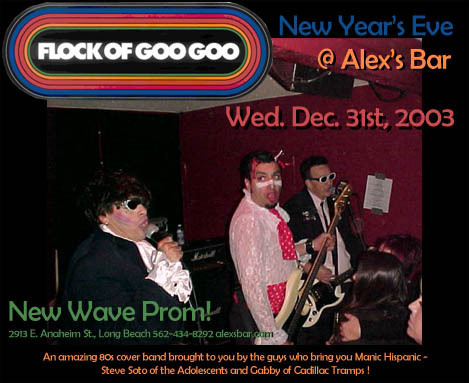 You are hearby invited to join us on New Year’s Eve at Alex’s Bar for the New Wave Prom featuring Flock of Goo Goo and Johnny Stab & the Stab Stab Stabs. The cover charge will be surprisingly cheap (under $20). Flock of Goo Goo is an amazing 80s cover band brought to you by the guys who bring you Manic Hispanic – Steve Soto and Gabby. Rumor has it that Gabby will be Madonna in a wedding dress and Steve will be Robert Smith…. Yours truly will be the Prom Photographer and we will have a cheesy grotto for you to get pics of you, your honey, and your drunk friends.